You are presented with a big list of commands. Scroll down the list until you find the exact name of your command. Check the Context dialog box to be sure you are in the right type of command. In this case, you need to be in Microsoft Word to edit the command you created for Word. 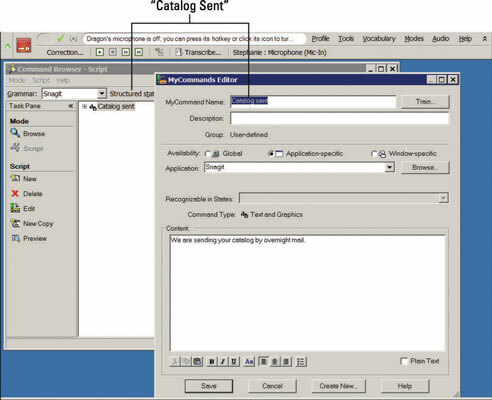 In this example, it is Catalog Sent. 2Say or click the name of the command. This will open the current command. 3Make sure you are in Script mode, and then choose New Copy. The Command Editor pops up with the command information you created. You can use the Create New button at the bottom of the dialog box. 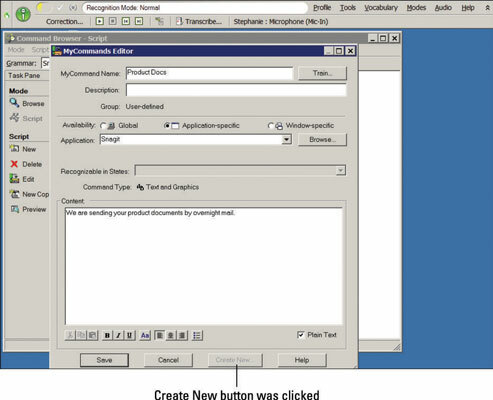 In this example, you use the Create New command as the basis for a new command. 4Click the Create New button. Notice that the name is incremented by one. So, for example, if the name was Catalog Sent, the new one becomes Catalog Sent 2. You can modify the contents of the command and change the name to something else more memorable. You now have a new command based on an earlier one, without having to start from scratch.